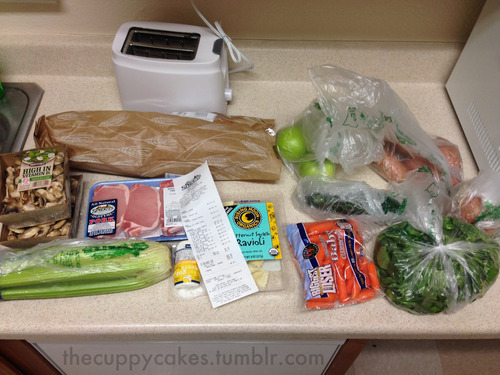 Last time we talked about groceries, I told you my couponing tricks of the trade. Strangely enough, I’ve completely abandoned couponing. I’m just too busy to take the time to hunt around, and I found myself falling into the trap of buying unhealthy things and buying things I don’t need. But cheap groceries without couponing is still possible! Here is an example of what I buy each week and how much it costs. With the lunch meat I had leftover from Target, this food definitely lasted me a week. I even still have the ravioli left to eat tonight! You can see that I am still buying food that I think is good for me to eat (less Cheetos, more mushrooms) but not spending an insane amount of money. Unfortunately, my budget for the week got a bit…derailed by my fear of the impending winter storm that Oklahoma got. I went and bought extra food for the weekend for me and my roommate. Oops. In a future post, I will try and provide you guys with an example of my meal plan!